The "Hello, world" app that you created in the previous tutorials only contains a single page of content. Most real-world apps contain multiple pages. 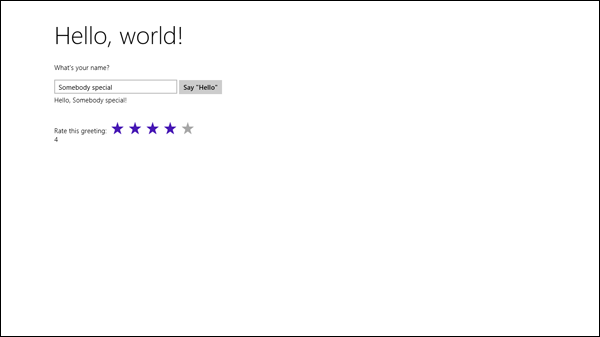 There are various navigation patterns that can be used in a Windows Store app. Navigation patterns will help you choose the best navigation pattern for your app. See the two primary navigation patterns (Flat navigation and Hierarchical navigation) in action as part of our App features, start to finish series. In this tutorial, you copy the code from your "Hello, world" app into a new app that uses the Navigation App template, and then you add an additional page. 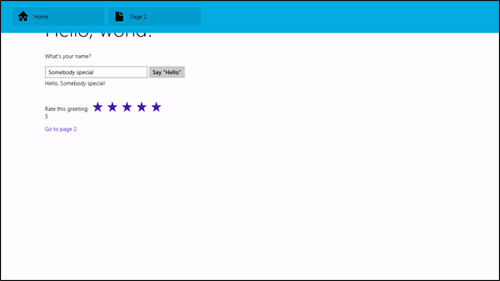 Use the Navigation App project template to create an app that contains multiple pages of content. Use PageControl objects to separate your code into modular units. Use the single-page navigation model to navigate between pages. Use an NavBar to provide navigation commands. This is the third tutorial in a series. Before you start this tutorial, read Part 2: Manage app lifecycle and state. We start with the code you created for Part 2. Another navigation model is single-page navigation, where you use a single page for your app and load additional data into that page as needed. You still split your application into multiple files, but instead of moving from page to page, your app loads other documents into the main page. Because your app's main page is never unloaded, your scripts are never unloaded, which makes it easier to manage state, transitions, or animations. 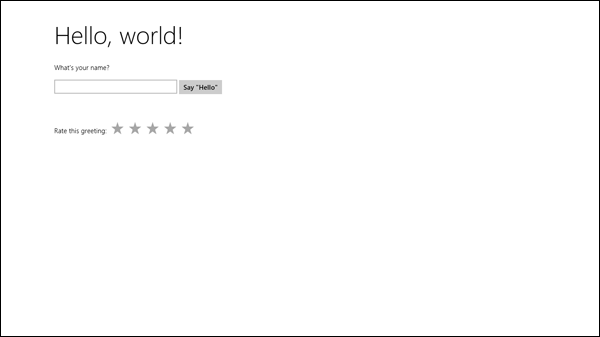 We recommend that Windows Store apps use the single-page navigation model. Launch Microsoft Visual Studio Express 2013 for Windows. From the File menu select New Project. The New Project dialog appears. The left pane of the dialog lets you pick the type of templates to display. For this tutorial, we use the Navigation App template. In the center pane, select the Navigation App template. 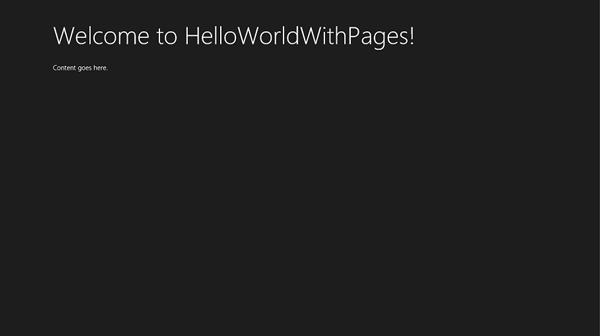 In the Name text box, enter "HelloWorldWithPages". Uncheck the Create directory for solution checkbox. 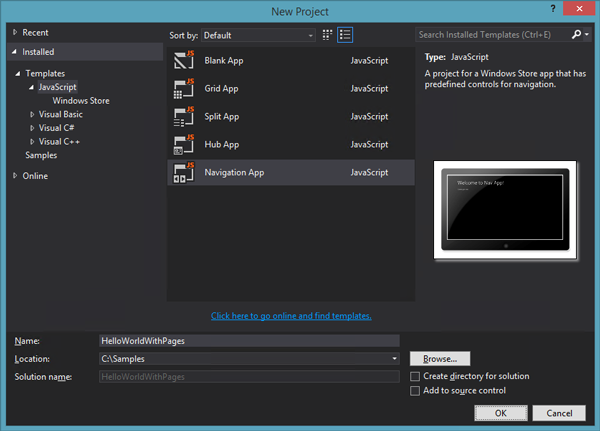 Visual Studio creates your project and displays it in the Solution Explorer. This file provides the PageControlNavigator helper class that you can use to display PageControl objects and navigate between them. You don't need it to display a PageControl, but it can make using them easier. The body of the file contains two elements: A div element for the PageControlNavigator and a commented-out div for an AppBar. Let's ignore the app bar for now and take a closer look at the first div element. This div element creates a PageControlNavigator control. The PageControlNavigator loads and displays our home page for us. 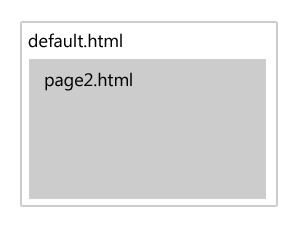 You use the data-win-options attribute to tell it which page to load (/pages/home/home.html). Go ahead and run the app. Although it's not obvious, the app is actually showing both default.html and home.html. It's similar to using an iframe to display a HTML page inside another HTML page. Our new app has two HTML pages: default.html and home.html. Where do you put your content? Use default.html for UI that should always be present, no matter which page the app is displaying. For example, you can use default.html to host a navigation bar. Use pages, such as home.html, for content that makes up an individual screen in the app. Let's open home.html and take a look at some of the markup it contains. It has a head element that contains references to the WinJS code and style sheets. It also contains references to the app's default style sheet (default.css) and to the other files that make up the home page (home.css and home.js). It has a page header area that includes a BackButton for backwards navigation and a title area. The template contains code that automatically enables the back button when you can navigate backwards. The button won't be visible until we add a second page and navigate there. It has a section for your main content. Let's add the content from our "Hello, world" app to the home page (home.html) of our new HelloWorldWithPages project. Copy your final HTML content from the default.html file of your "Hello, world" app into the main content section of the /pages/home/home.html in your new project. 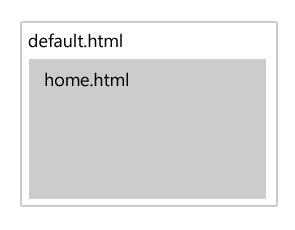 Move the heading content that you copied to the h1 element that home.html provides for you. Since home.html already contains a main content section, remove the "mainContent" div element that you copied (but leave its contents). Each PageControl has its own Cascading Style Sheets (CSS) file. Copy the greetingOutput style from the default.css file you created in Part 1: Create a "Hello, world!" app to home.css. You've recreated the content from your original "Hello, world" app. Next, we add interactivity by copying your "Hello, world" event handlers. This file looks quite a bit different than your default.js file. For one thing, it's much shorter. That's because default.js already handles activation and core app logic. 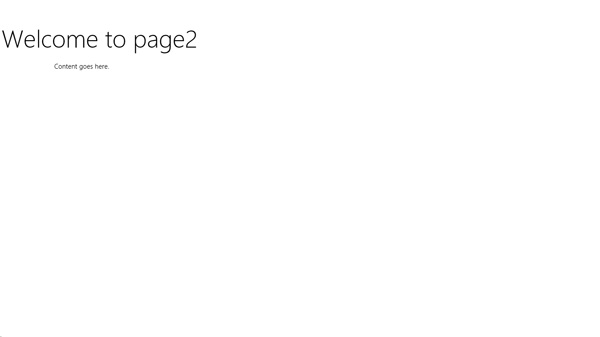 Each PageControl only needs to contain logic for the page itself. One of the first lines of code, a call to the WinJS.UI.Page.define function, creates the PageControl object. This function takes two parameters: the URI of the page ("/pages/home/home.html" in this example), and an object that defines the members of the PageControl. You can add any type of member you want. You can also implement a set of special members, described by the IPageControlMembers interface, that automatically get called by the app when you use the PageControl. The home.js file created by the template defines one of these special members, the ready function. The ready function is called after your page is initialized and rendered. This is a good place to attach event handlers. You might notice that the code doesn't include a call to WinJS.UI.processAll. That's because the PageControl calls it for you, automatically. By the time the ready function is called, WinJS.UI.processAll has already been called and has completed its processing. In Part 1: Create a "Hello, world!" app and Part 2: Manage app lifecycle and state, you defined three event handlers: buttonClickHandler, ratingChanged, and nameInputChanged. Copy those event handlers to your home.js file and make them members of your PageControl. Add them after the ready function that the template created for you. // Save the session data. // Store the rating for multiple sessions. // Store the user's name for multiple sessions. Now we need to attach our event handlers. In Parts 1 and 2, we created a then function for the Promise returned by WinJS.UI.processAll. Things are a bit simpler now, because we can use the ready function to attach our event handlers. 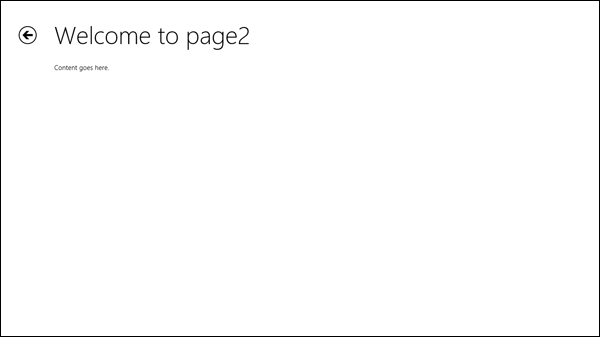 The ready function is called after the PageControl has automatically called WinJS.UI.processAll for us. Copy the code that attaches your event handlers to the ready function in home.js. // Retrieve the div that hosts the Rating control. // Retrieve the actual Rating control. // Register the event handler. // Retrieve the button and register our event handler. Run the app. When you enter a name and click the button, it displays a greeting. When you rate the greeting, it displays the numeric rating value. We've almost recreated the functionality we had in our "Hello, world" app. The only thing we need to do now is restore the app's state when the user launches it. The user name and rating. We restore this state regardless of how the app was shut down. The personalized greeting. We only restore this state if the app was successfully terminated the last time it ran. Copy the code from the "Hello, world" app that restores the user name and rating. Add the code to the ready function in home.js. // Restore the user name. We only want to restore the personalized greeting if the app was successfully terminated the last time it ran. Unfortunately, our PageControl doesn't provide a built-in way for us to check the app's previous execution state: that info is provided to the onactivated event handler in our default.js file. But there's an easy solution to this problem: we just need to save the app's previous execution state in the sessionState object so that our PageControl can access it. In your default.js file, add code to your onactivated handler to save the previous execution state. Save the state by adding a property to the sessionState object named previousExecutionState. // Save the previous execution state. Here's the complete ready method. Run the app. We've now duplicated the functionality we had in our original "Hello, world" app. Most apps contain several pages. Let's add another page to our app. Because we're using the Navigation App template, it's easy to add additional pages. In the Solution Explorer, right-click the pages folder and select Add > New Folder. A new folder appears in the project. Rename the folder to "page2". Right-click the page2 folder and select add Add > New Item.... The Add New Item dialog appears. Select Page Control from the list. In the Name text box, enter "page2.html". Click Add to add the PageControl. The new PageControl appears in the Solution Explorer. The new PageControl has three files: page2.css, page2.html, and page2.js. You've created a new page. In the next step, you learn how to navigate to it. Right now, we have a second page but no way for the user to get to it. Let's update our home.html page by adding a link to page2.html. Open your home.html and add a link to page2.html. Run the app and click the link. It seems to work: the app displays page2.html. However, there's a problem: the app performed a top-level navigation. Instead of navigating from home.html to page2.html, it navigates from default.html to page2.html. What you want instead is to replace the content of home.html with page2.html. Fortunately, the PageControlNavigator control makes performing this type of navigation fairly easy. 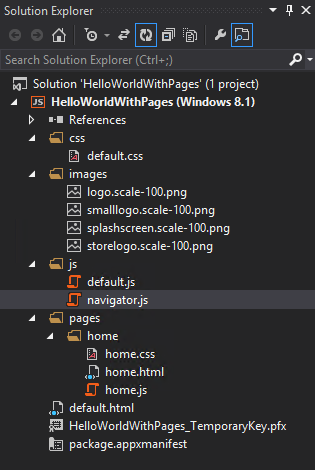 The PageControlNavigator code (in your app's navigator.js file) handles the WinJS.Navigation.navigated event for you. When the event occurs, the PageControlNavigator loads the page specified by the event. The WinJS.Navigation.navigated event occurs when you use the WinJS.Navigation.navigate, WinJS.Navigation.back, or WinJS.Navigation.forward functions to navigate. You need to call WinJS.Navigation.navigate yourself rather than using the hyperlink's default behavior. You could replace the link with a button and use the button's click event handler to call WinJS.Navigation.navigate. Or you could change the default behavior of the hyperlink so that when the user clicks on a link, the app uses WinJS.Navigation.navigate to navigate to the link target. To do this, handle the hyperlink's click event and use the event to stop the hyperlink's default navigation behavior, and then call the WinJS.Navigation.navigate function and pass it the link target. In your home.js file, define a click event handler for your hyperlinks and make it a member of your PageControl. Name it linkClickEventHandler and add it after the nameInputChanged handler. Call the preventDefault method to prevent the default link behavior (navigating directly to the specified page). Retrieve the hyperlink that triggered the event. In the home.js file's ready function, attach the event handler to your hyperlinks. The WinJS provides a WinJS.Utilities.query function that makes it easy to retrieve a number of elements on the page. The WinJS.Utilities.query function returns a QueryCollection, which provides additional methods for attaching and removing event handlers. Let's use the WinJS.Utilities.query collection and the listen method to attach our linkClickEventHandler. The nice thing about this approach is that it will work for any number of links on the page. We only have one link right now, but, with this approach, we could add more links and we wouldn't have to change our code. Run the app and click the link for page2.html. Now the page displays using the proper navigation pattern. The NavBar is like an AppBar that's dedicated to navigation commands. (In fact, the NavBar is a subclass of the AppBar.) It can contain a simple list of links, and it can contain several levels of links organized into categories. You can populate the NavBar by hard-coding entries, programmatically updating it, or by using data binding. The NavBar appears at the top of the app screen when the user needs it. The user invokes the NavBar by performing an edge swipe, pressing the Windows logo key+Z, or right-clicking. The NavBar also supports vertical layouts and split-navigation items (navigation items that have child navigation options). The NavBar is highly customizable: you can use CSS to style almost any aspect of the NavBar and its contents, and you can also create custom navigation items. A NavBarContainer object, which contains navigation items (NavBarCommand objects) and supports both pagination and panning and scrolling. You can have one or more NavBarContainer objects in a single NavBar. You use NavBarContainer objects to define groups of navigation options. One or more NavBarCommand objects. These are what the user clicks to navigate. Our app contains several pages. Where should we add our nav bar? If your nav bar contains commands that should be available to every page, add it to your default.html file. If your nav bar is different from page to page, you can define a different app bar in each of your PageControl objects. You can also define a central navr bar in default.html and then modify as you load different PageControl objects. Let's create a simple nav bar that lets the user navigate between home.html and page2.html. We'll define our navr bar in our default.html file. Open your default.html file. Add a NavBar control as the first child of the body element. 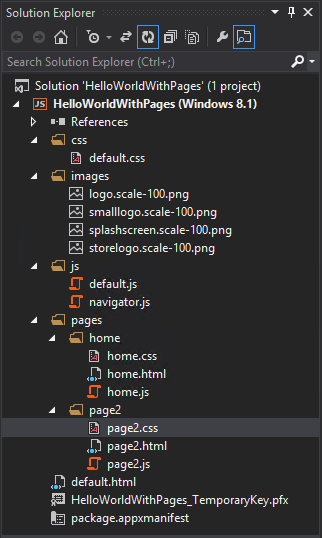 Each nav bar contains one or more NavBarContainer objects. You use NavBarContainer objects to define groups of navigation options. Add a NavBarContainer to your nav bar. Each NavBarContainer contains one or more NavBarCommand objects. These are what the user clicks to navigate. Add NavBarCommand objects to your NavBarContainer. label: The label to display for the command. location: The location to go to. Run the app. To show the bar, make an edge swipe, press Win + Z, or click the right mouse button. When you click a button, the nav bar automatically calls navigate and takes you to the page. You've declared an nav bar. Next, let's style it. Open your default.css file and, at the beginning of the file, create a CSS style for the app bar that changes its background color. Run the app. Now you can use the nav bar to navigate between the two pages. Congratulations, you're done with the third tutorial! You learned how to create a project that uses the Navigation App template and how to use PageControl objects. You also learned how to create an app bar. In the next part of this tutorial series, you learn how to create a more complex app. Go to Part 4: Layout and views.